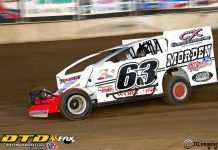 ROSSBURG, OH – When the World of Outlaws and Eldora PR folks write their stories about Night No. 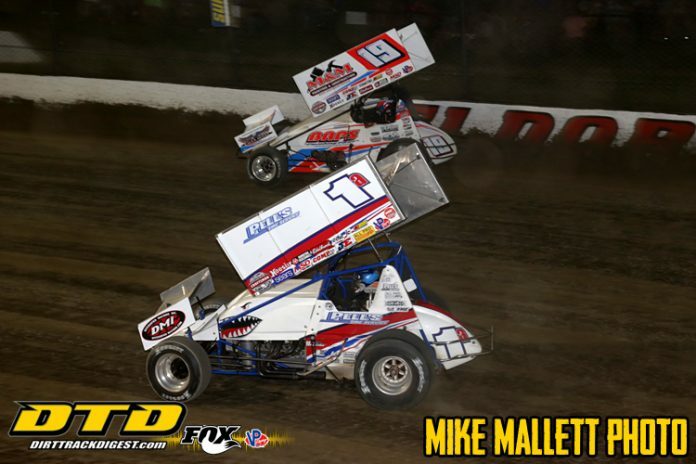 1 at Eldora to kick off the 35th Anniversary Kings Royal Weekend it will mostly likely say “Shane Stewart wins the Joker’s Wild Night (The catchy name for the Thursday night program) to kick off Kings Royal Weekend”..or something to that fact. And don’t get me wrong, those headlines are just and deserving. But, Jacob Allen (and allow me to steal a baseball quote) darn near produced the shot heard round the world. The son of Bobby Allen ran the lane made famous by the legendary No. 1A. While most were throwing their sprints up against the Eldora wall Allen found a fast lane, I mean a REAL fast lane down low and went from his ninth starting spot to the lead just as lap 10 was scored thrilling the big crowd. He passed Schatz, crowd went nuts, passed Shane Stewart, crowd went nuts, passed David Gravel, crowd went nuts. This was cool to watch! Just as that lap ten was scored and the pass for the lead happened the only caution came out when Stewart and Gravel came together right behind Allen with Gravel spinning into the turn one wall. When the green lights shined, Allen did start first but Stewart had more momentum and took the lead going down the backstretch. Allen wasn’t deterred and stayed to plan edging back ahead on lap 14. Stewart is savvy and he too went to the bottom. The changing of lanes did seem to make Allen’s effort lose some steam and soon Schatz, Tim Shaffer and others found their way past Allen. When the checkers did wave on lap 30 Jacob’s final tally showed him in seventh just a whisker behind Sheldon Haudenschild. There was Stewart in the hallowed victory lane that his Eldora collecting his first WoO win of the year but you can still tell there was a buzz in the air and it was the result of Allen’s effort. Allen is indeed turning some heads as of late among the Outlaw band. He has been stout in time trials and at many events he has found himself in the dash. When you’re in the dash you know you’re going to start either in the top six or eight. Caleb Helms was the last car to show up and unfortunately suffered engine woes that could see him be the first car to go home early…. Randy Hannagan is driving the Paul May #71M…. New for this year, the winners of the two preliminary nights can choose when to time trail on Saturday. Previous articleMatt Sheppard wins the Race for the Cure 150 at Cornwall Motor Speedway!